We are fortunate in Central Florida grilling season is year round, but a lot of the world is just now going through seasonal rotation, welcoming warm weather and breaking out the grill. 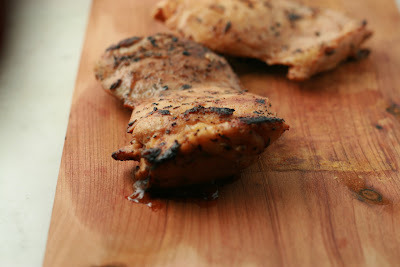 Marinating meat before grilling, in this case chicken, gives it such a boost in flavor. The recipe I am sharing is one of my very favorites for two reasons: you can't beat the flavor and I have the marinade ingredients in my kitchen most of the time, i.e. no shopping. I go back to it every year for chicken. I love its lemony goodness. Think about this, you can choose your presentation style and cuts, it works with a whole chicken cut up, bone in or boneless chicken breasts, thighs, chunks, cubes. You can grill the parts whole or make shisch kabobs. 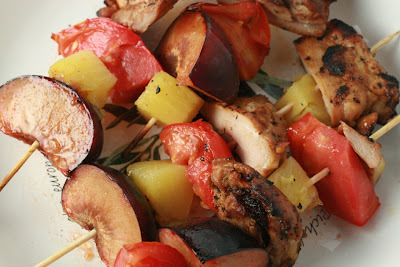 Today, since I am only cooking for two, I opted for boneless thighs, made two ways, flat grilled and on wooden skewers, laced with fruit and tomatoes. Mix marinade in a large zip-lock bag and add chicken pieces. Marinate 4 hours or longer. Grill. Note: for the kabobs, soak the wooden skewers in water prior to lacing chicken chunks with your choice of fruits or veggies. In the photo: fresh plums, quartered, canned pineapple chunks, fresh tomato quarters. Also very good, try fresh or canned boiled new potatoes, bell pepper slices, fresh mushrooms, red or white onion quarters, fresh peaches. Grilling kabobs is so great! Great idea to add plums. That sounds delicious.